Ed Notes Online: Breaking - Contract Passes - OT/PT Voting Report - They Get 90 Minutes Off - Big Whoopie! Breaking - Contract Passes - OT/PT Voting Report - They Get 90 Minutes Off - Big Whoopie! UPDATE from UFT: Final DOE-UFT contract ratified: Occupational and physical therapists, school nurses and supervisors of nurses and therapists voted on Jan. 31 to ratify their new contract. Nearly 60 percent of the 2,176 UFT members who cast ballots voted “yes.” The contract passed by a majority of each of the three UFT chapters in the bargaining unit. Thank you for helping to spread the word to school nurses and therapists in your building about the importance of voting. We were informed of the contract the night before (!) and given permission to leave 90 minutes early the next day to vote. The message from the UFT stressed that we would need our UFT membership cards to enter the UFT building, which is not and never has been true (you just need picture ID). The guard on the first floor stalled people asking if they had received their UFT cards, when they said no, he insisted they must have gotten them, when I showed him that I had downloaded the UFT app, but not added my personal information, he wanted me to fill that out then and there---I finally just asked if I could please do it later and he reluctantly let me and the others go up. Why would they pick this one day to enforce that? I can only think they must have been hoping people wouldn't vote. Besides it being a polar vortex, so it was literally dangerous to be outside, but they said the rush was so we could get our 2% raise by Valentine's Day. So sentimental!!! Unity Caucus apologists jumped down my back over my not reporting that OT/PTs got 90 minutes off to go vote. Jeez! Happy now that I reported on your largess? We know why -- they want this passed by hook or by crook. Let's face it -- the UFT leadership is in a bit of a bind. If they get significant improvements after a NO vote it sends a message to the members for the future. So it's crumbs. The leadership said they "heard" the (UFT engineered) "pleas" of the nurses chapter who voted YES by 95% despite going to the Ex Bd and complaining about how lousy their contract is. The nurses handed out a 2 page leaflet of complaints but then said because they had voted 95% for a contract that was still 95% lousy they wanted their money. I laughed out loud despite having my mouth full of Ex Bd food. At least 2/3 of the OT/PT people had the nerve to say NO. Question is: Will they vote it down again or have they been beaten into submission by the UFT machine? I wouldn't blame them for taking the money at this point because how can they have faith that the leadership has their real interests at heart? In fact their interest is to make an example for future contracts - see, turn it down and only get bupkis. 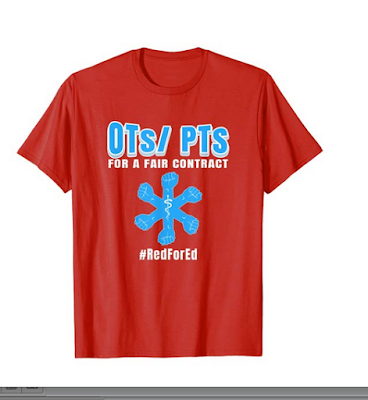 Now, given that the contract NO Vote on the OT/PT was months ago, the organizing attempts of the OT/PT's for a Fair Contract did not have enough of an impact. They just weren't ready for the speed of this- which was very predictable. The reason they were kept in the dark and the vote moved so fast was to prevent them from organizing. Even too fast for their FB efforts. But the vote totals will be an indication of how effective they have been over the past few months. I'm seeing all this from a distance based on a few contacts. asked back in December if they were going to the PEP and I thought they were. So I was there to video tape but no one showed and I left and went to a movie. They held some meetings and also tried to organize at borough OT/PT meetings but were treated like criminals by UFT officials -- they sent me reports of the outrage but didn't give me permission to publish them. I can only guess they were being careful about exposing the leadership -- never a good idea as the only thing leadership responds to is public exposure. They said they would focus on the January 30, 2019 PEP which I thought might be too late. And it was as the UFT announced the revised contract vote for Jan. 29. Hey, it gets cold in January and weather becomes an issue. And it certainly did. MORE Caucus, which was "helping" the OT/PTs has been so focused on the UFT election, they didn't exactly do very much in terms of organizing other than include pleas to support OT/PTs in their lit and they will make it a big campaign issue and will probably get the votes of OT/PTs. Fact is MORE said very little or anything about the OT/PTs until they voted it down. Now I and others knew from the 2016 election that there was a lot of unhappiness in the OT/PT group and I predicted (wrongly) that they might come close to voting it down in 2016. If MORE were serious it would have actually done something over the past 3 years. Fundamentally, I see the MORE moves as naked opportunism. A plea went out from MORE the morning of Jan. 30 to attend the PEP that night. That's pathetic organizing 101. I wonder how many MOREs actually showed. The weather was brutal, as it was the next day, voting day. My advice for the future - strike while the iron of the NO vote was hot -- they should have attended every Ex Bd meeting, hold rallies, etc. Of course MORE's alienating their own elected members of the Ex Bd didn't exactly help. The OT/PTs did hold one rally organized by MORE outside the Dec. DA but MORE was too busy with organizing petitions to do anything at the January DA. Which is what I told them would happen when I argued they should not run but organize -- that the election was a pit that you fall into and a distraction from long-term organizing. With Unity attacking the OT/PT organizers as being manipulated by outside socialist groups -- red-baiting 101--- some began to back away from open MORE support. MORE is running an OT/PT as an officer to make a point. But MORE is exclusionary and doesn't want any other groups inside the UFT who might stand with the OT/PTs to get involved so they can take credit. If OT/PTs turn the contract down again, there are organizing opportunities for the Fair Treatment group inside the chapter. But more people must get involved. If it is only a few leaders and not enough rank and file, it will go nowhere. They must fight back against the leadership attempts to intimidate them -- like stealing their sign-up lists and preventing them from reaching out to people. I saw a call on FB for people to use the Janus decision and stop paying dues when given the opportunity in June and consider the money saved as a raise. If that happens it will be only individuals, not an organized effort as the group leading the fight back would never go in that direction. Leaving the UFT hurts any future organizing. But it will be interesting to see if that happens. Really, what recourse do people have? If there was another union out there one could see an organized decertification campaign and replacement of the UFT as their bargaining agent, but I think that would be a death spiral. The UFT is too powerful for another union to get involved. So basically, the idea is to keep organizing and ultimately take over the functional chapter by electing their own chapter leader and ex bd and delegates to the DA and live to fight for the next contract. Elect a group that wouldn't be giving cover to the leadership. The current people who were elected last spring, urged a YES vote. So when 2/3 don't agree that is a sign of a serious disconnect in the chapter. I have to be honest here -- the people protesting should have been on this case last spring and ran to lead the chapter. What happened was totally predictable. And if MORE were actually a viable organization they would have been on this last spring. Maybe next time. If organizing does take place the OT/PT opposition has to decide if it helps or hurts to be very tied into MORE, given that MORE has alienated an entire swath of the opposition to Unity. But that chapter election is not until the spring of 2021. Though they could try a recall of the chapter leader with one third of the signatures. A good potential organizing opportunity. If you are an OT/PT, get in touch if you want to talk about future strategies. This space is yours to share your thoughts. Anonymity guaranteed.